* Mechanical and Aeronautical Engineering at Institute of Technology Bandung (ITB). In order for AUN/SEED-Net students to produce high quality thesis research of international standard and to ensure the completion of the master’s degree within two years, AUN/SEEDNet provides vital support, in terms of financial and academic, through joint thesis research supervision, to AUN/SEED-Net Master’s students at all Host Institutions. The joint thesis research supervision will be carried out through the Collaborative Research Program, which has been created by each Host Institution for a few well-defined research themes (or research umbrellas) in consultation with Japanese Field Coordinating University, each of which is a collection of interrelated and progressively conducted thesis research topics. Each AUN/SEED-Net student (including doctoral sandwich student) shall conduct thesis research under one of these research themes. Besides, according to AUN/SEED-Net Students’ Mobility scheme which is promoted to enable students to benefit educationally and culturally from the experience of learning at other Member Institution(s), Master’s students may be supported to take a course(s) or conduct research at other Member Institution(s) for a short period. Students are advised to consult with their advisors and Host Institution on the necessity, possibility and procedures of their mobility. Those who complete this Master’s Degree Program with outstanding thesis research are encouraged to pursue a doctoral degree in one of the above nine fields either at Japanese Supporting Universities under the “Doctoral Degree Program in Japan”, or at Host Institutions (in Indonesia, Malaysia, the Philippines, and Thailand) under the “Doctoral Degree Sandwich Program” with co-supervision by Japanese professors, or at the two Singaporean universities (NTU & NUS) under “Doctoral Degree Program in Singapore”. The upgrading scheme can be implemented at some Host Institutions for Master’s students who prove outstanding performance and wish to get upgraded to doctoral level. The details of upgrading process will be applied to respective Host Institutions’ regulations. (1) To increase the number of high quality Master’s degree holders in engineering at Member Institutions which would be necessary to contribute to a sustainable industrial development of ASEAN countries. (2) To strengthen the Master’s degree programs at the Host Institutions so that the production of high quality Master’s degree holders in engineering needed for the region is materialized within the region in collaboration with the Member Institutions and Japanese Supporting Universities. 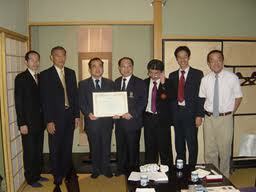 (3) To strengthen human networking among teaching staff of Member Institutions and Japanese Supporting Universities. (a) Applicants must hold a Bachelor’s degree in an appropriate discipline of engineering, or to be awarded the Bachelor’s degree before starting the Master’s degree program. (b) Applicants should be ranked within top 10% of the class, or have the grade point average of 3.0 or higher from the grade point system of 4.0 in their undergraduate study. (c) Applicants must be young faculty staff of Member Institutions, or graduating students, or young graduates of Member Institutions who are strongly motivated to pursue a professional career as faculty staff at Member Institutions. (d) Applicants should be under the age of 30 at the time of application and capable of carrying out independent research. (e) Applicants who have already received another equivalent major award, scholarship or a salary to undertake a proposed course are not eligible for scholarships. (d) Applicants can apply to the maximum of two Host Institutions, but cannot apply to any institution within their own country. Around 45 scholarships for the Japanese Fiscal Year 2011 will be supported (approximately five scholarships for each host field at Host Institutions in Indonesia, Malaysia, the Philippines and Thailand). The scholarships cover tuition fees, living expenses, health insurance, visa fee and airport tax, and a round-trip air ticket, in accordance with the AUN/SEED-Net Project regulations. There may be partial support(s) from concerned Host and Sending Institution. The commencement of scholarship should be within the Japanese Fiscal Year 2011; that is, awarded students should commence their study within April 2011 – March 2012. The duration of the scholarship is strictly two years, counting from the day of arrival at a Host Institution. Students who need more than two years to acquire a degree will be expected to self-finance during period of extension. Note: The AUN/SEED-Net Project, in consultation with the Host Institution, will terminate the award of any student who fails to maintain satisfactory progress at the Host Institution. (1) Applicants submit one set of AUN/SEED-Net’s Application Form (for scholarship) and two sets of Host Institution(s)’ Application Form(s) (for university admission), along with other required documents to the contact person at Member Institutions (as Sending Institutions) to which the applicants belong. The list of names of contact persons at Member Institutions (or Sending Institutions) is given in Attachment 3. (3) AUN/SEED-Net will check all required documents and request missing documents from applicants through Sending Institution, if necessary. (4) AUN/SEED-Net forwards the collection of Host Applications to respective Host Institutions for admission screening. (5) Host Institutions screen applicants for admission and identify potential advisor(s), then inform the admission result to AUN/SEED-Net. (6) AUN/SEED-Net starts its screening for scholarships and informs the result to respective Sending Institutions. Note: At the time of admission and scholarship screening, Host Institutions and AUN/SEED-Net may contact Sending Institutions and/or applicants for missing documents or further information. (7) Sending Institutions inform their successful applicants to confirm their acceptance of scholarships via Reply Form and submit missing documents, if any, to AUN/SEED-Net. Contractual matters between Host Institutions and AUN/SEED-Net begins. Applications for the Master’s Degree Program should be submitted, in printed forms, to the AUN/SEED-Net Project by January 31, 2011. The scholarships, in principle, should be distributed across fields and across Sending Institutions. Demikian kami sampaikan tentang Master Scholarships by AUN/SEED-Net semoga informasi tentang Master Scholarships by AUN/SEED-Net ini bermanfaat.